The 20 Best WordPress Plugins recently published by PC Magazine is worth a look if you are interested in improving your WordPress site. There are a few that I have tried including Akismet and JetPack. We don’t get enough traffic here at Cooperland to have to worry much about spammers disrupting the blog, but it is nice to know that there are solid options to fend off an attack if necessary. The JetPack applications look pretty cool as well. In particular, “After the deadline” has some nice tools to brush up the grammar and spelling on your posts, but the requirement to link your self hosted WordPress site to WordPress.com turned me off. “After the deadline” is available on its own without JetPack, so that is the way that I went for that plugin. I will have to do more research on that before I utilize JetPack. Anyway…….a pretty nice article if you have interest in WordPress. KCD Theater opened its fall season with Nanci Griffith last night accompanied by Pat McInerney, Pete Kennedy, and Maura Kennedy. Headmaster Brad Lyman introduced the act and stood back to enjoy the show. Nanci performed before a sold-out audience of adoring fans and friends that seemed to really enjoy the show. The sound in the new KCD Theater was great all evening. The Kennedy’s opened the evening on their own and then came back out with Nanci to provide backup in all the right places. The Griffith performance started with a John Prine classic…..”Speed of the Sound of Loneliness” and moved on to a oft-performed standard…” Simple Life” which was a collaboration with long-time friend Elizabeth Cook. Nanci spoke from the heart when relating the story of the inter-racial marriage of Mildred and Richard Loving as the inspiration behind “The Loving Kind.” She remarked that the government needed to get out of the loving business especially the Loving’s business! When you can’t find a friend you “listen to the Radio” and last night, during this Loretta Lynn tribute song, Pete Kennedy’s musical range was highlighted with a tremendous bass solo. Other highlights included the Kate Wolf composed “Across the Great Divide” and a duet with back-stage man Bruce McKay on “Gulf Coast Highway.” The night would not have been complete without the classic Julie Gold anthem…..”From a Distance” or a rousing rendition of “Tequila after Midnight” written by Nanci’s honky-tonk songwriter idol Dee Moeller. Probably the liveliest song of the night was “Hell No, I’m Not Alright.” The band and crew pulled out all the stops for this one. Bruce McKay returned to the stage along with crew member Phil Koffman as the “Clap Brothers” to engage the audience in a clap along, but this song was an even greater opportunity to show off the musical talents of Maura Kennedy with her stirring guitar solo on Pete’s Stratocaster. The audience clearly loved the performance and Nanci loves to sing and talk about things she is passionate about. The KCD Theater continues to produce great acts and has become the place to go on the East side of Louisville. MUSIC SMASHER is a pretty cool little web tool developed by Matt Montag that allows you to query the database of popular music services. Spotify, Rdio, Grooveshark, and Napster are available for smashing. Rapsidy and Bandcamp may be coming soon. In any case, the two major providers had most of what I listen to on a regular basis with Spotify nosing out Rdio by hair. This is a pretty interesting perspective on the parallels from the political environment that preceded Prohibition to today’s environment Purists Gone Wild: Prohibition, Revisited? – NYTimes.com. The “other” parallel from the dry years concerns personal liberties. With the 18th Amendment, the prohibitionists took away the right to make a basic choice. Gov. Rick Perry, now leading the Republican polls for president, has vowed to do the same, promising to amend the Constitution in several ways to take away freedoms. One would prevent gays from ever getting married. Another would outlaw a woman’s right to decide when to end a pregnancy. A third would repeal the 17th Amendment, which gives citizens the right to directly elect their senators. The author refers to the monomaniacal anti-tax pressure groups and the necessity for Republican political aspirants to pledge their fealty to Grover Norquist which is all well and good but doesn’t ring quite as true to the run up to Prohibition as some of his other points. A little discussion about the healthcare mandates and Republican resistance to mandatory coverage would have made this article a bit more balanced. Hopefully other similarities to the early 20th century will not be replicated in this century. If they do, we are in for a long 30 years, and we can all look forward to a couple of world wars which bookend a depression. Have you ever been uncertain about the floor you parked on in a parking garage? If not, you either don’t park in a parking garage very often, or have an assigned space. So what does this have to do with anything? I am not sure, but the other day when I was balking at the elevator door in my parking garage and was obviously uncertain about the location of my car, the guy in the elevator says, “Big World – Big Garage”. What could that comment possibly mean? Was I being heckled in the elevator of the parking garage that I use every day or did I miss that pithy quote in a famous movie. As I hesitated exiting the elevator longer than I would have had the guy kept his mouth shut, all I could think to say as I walked away was “Thanks for that”. 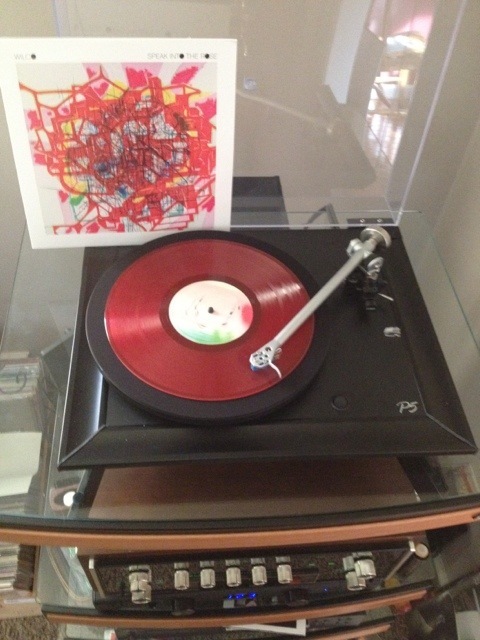 Seriously…Big World – Big Garage….did this guy just have to say something? Wouldn’t “good luck” be more encouraging and helpful? I don’t want to seem overly sensitive, but I still wonder what the message was supposed to be. I guess I will never know, but I may make a t-shirt…..Big World – Big Garage……would you buy?? If I were to evaluate my investment return on real estate, I am sure that I would be sorely disappointed. We bought our first house in 1985 for a little more than $60 thousand and felt lucky to get out of it 6 years later for a little over $80 thousand. Hardly a great return, when you consider we built a garage, waterproofed the crawlspace, and remodeled the master bathroom. All in all it was a decent starter house and a great opportunity to learn about moisture problems, aluminum windows, and a septic system. Our next and current home was a two-story with a basement on a large lot. We stretched to buy it in 1991, but it still serves us well with a good neighborhood, proximity to shopping, and a first rate elementary school within walking distance. Nine years after moving in, we installed an in-ground swimming pool, deck, and hot tub in the back yard. We have also updated the kitchen, installed several new windows and doors, improved the electrical system, and replaced the entire heating and cooling system. If you add up all of the improvements with the original cost, we would be very lucky to get our money out of our current home. 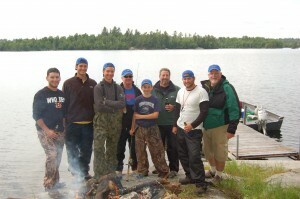 The 2011 fishing trip with all the boys was a great time. The weather was perfect and the fish were biting. There were 11 species taken by the group of eight. Near the end of the week, we had a great shore lunch on the lake. We cooked lots of fish and had this group photo taken. We packed in all the equipment to fry fish and french fries. 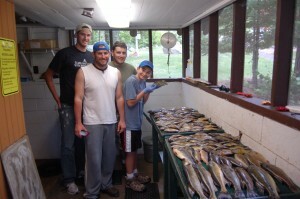 The boys were able to catch fish while we were cooking. We also had a nice campfire while we were there. The Muskie were active – Jack caught a 42 inch model the very first night in camp. Jim-Jim and his crew attracted the attention of a very large Muskie out on Hibbing Point. Jim-Jim hooked a small walleye and before he could get in the boat, the Muskie attacked the walleye. A long fight ensued and ultimately Jim-Jim claimed the walleye, but the boys couldn’t net the Muskie at the same time. 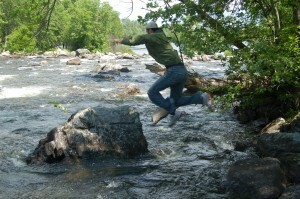 Mind you the Muskie was never hooked…..it was just hanging on to the walleye that Jim-Jim had hooked. The story that the boys told about that adventure will go down in the history of this event and will undoubtedly be told again and again over cocktails for years to come. There were lots of nice fish taken during the week. Norweigian Bay produced a lot of nice bluegill for us and Square Rock Island was productive for small-mouth bass (for me, not so much for Sam.) We spent some time back on the Partridge River at the stairway to nowhere and caught lots of fish both times that we were there. We even saw someone sitting on the dock at the stairway to nowhere, but we never found out where he came from…..as you might expect. The Moose Ball Islands were not as productive as years past, but we noticed that several people were fishing the reefs just North of Greater Moose Ball. Sam caught a very nice walleye over by Treasure Island on and ugly yellow shadrap. It was really windy that day and we were trolling between the islands when he picked that fish up. Try as we might, it was the only fish we caught in that area. Sam and I fished together everyday and were able to see a lot of the lake in the boat that we rented. I hope his memories of these fishing trips are as important to him as they are to me. It is great to be able to spend time with your son in the great outdoors. There is something about it that is very fulfilling in a hunter gatherer sort of way. Anyway…enough of that: On Friday afternoon, we took a long cruise down to Vermilion Dam. I hadn’t been down there in several years and Sam had never been, so we took a few hours off from fishing and did some sightseeing. We hiked down the portage path to the river between the lakes and took some pictures. After that we went over to the Vermilion Dam Resort and bought some gas for the trip back to the more familiar part of the lake. On the way back we took a detour through a string of red-green bouys and headed back on to the east end of the lake. We actually went past the point where the map has to be turned over….this was new territory for both of us. After a mile or so, we had seen enough and turned back for the west end of the lake. Lucky and the boys were sitting out on a reef bobbing for walleyes. Jeff had caught a couple, so we anchored in to see what we could catch. The fishing was pretty slow at the time, but I was lucky enough to convert on the single bob that I had while I was there. Sam reeled in a rock bass with some big shoulders on it, but that was about all there was for us that final day. Everyone caught a walleye this year, but it took Alex until the end of the day on Friday to finally come up with his. What makes that final fish of the trip even more memorable is that he caught it – after – a trip to the emergency room to repair his leg from a fillet knife puncture that he inflicted upon himself while trying to get the fish basket open. The boys getting ready to fillet some fish! You may notice that we are missing one boy from this picture. That is because Alex is on his way to get his leg stiched up and we were getting ready to clean some fish after getting Alex up off the ground. Lucky is getting to know the emergency room pretty well. He and both of his boys have made a trip there at one time or another. They really need to stop that tradition, and they especially need to avoid the emergency room when there are this many fish to clean. Overall, it was a great trip with a great group of guys. I look forward to the opportunity to do it again sometime soon.